Last night, the Town of Ulster’s Senior Center was filled to capacity – mostly with Town of Ulster residents – to learn more about the Midwest company GlidePath’s proposed project called the “Lincoln Park Grid Support System”, a natural gas power plant in the Town of Ulster. Based upon statements made by citizens, it was clear there was a great deal of skepticism regarding the safety and even the need for such a project in the area. Established in 2013, GlidePath has ten renewable projects in its portfolio. The Lincoln Park Grid Support System project, a 20-megawatt hybrid natural gas (diesel back-up) and battery generation system/power plant proposed for the Town of Ulster, would be the company’s first gas-fired project. 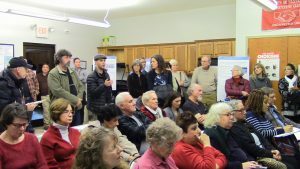 Town of Ulster citizens took a show of hands to see who was in favor of the project and who was not. Only one hand in support was raised. Peter Rood, Chief Development Officer of GlidePath stated that it would be up to Town of Ulster elected officials to decide whether or not the project would be built. UCIDA Rejects Request for Meeting Time Change. This morning, the Ulster County Industrial Development Agency (UCIDA) rejected requests to move their regular meeting time from 8:00am to after 5:00pm. Here are some of the highlights of the morning board discussion. Several members challenged KingstonCitizens.org as having a large base but only producing a handful of letter requests and citizens before them on the matter. Last month when the item was before the board, it was tabled for further discussion. This occurred right before the holidays in late December, giving the public a narrow opportunity to submit a letter of support for a meeting time change. Ask even the savviest of citizens what the UCIDA does and you’ll be hard pressed to find anyone who can tell you. This is in part why we thought to pursue a meeting time change as a first step could allow for the potential of participation. For those board members who attributed their rejection in part due to the number of requests as insignificant, it is a poor way to build bridges of trust and better relations with the public, particularly those who wish to be more of a participant in the important work of the UCIDA. Another board member, perhaps in reaction to the citizens in attendance being Kingston residents, shared with us his insight that ‘there is a bigger world outside of Kingston”. Citizens had some trouble hearing the board during their discussions in Legislative Chambers, where microphones were available. Perhaps next month, if the group meets in the same location and there are people in the audience, they might elect to set them up. There were some useful points made to consider, such as the potential ‘overtime’ necessary to pay staff for evening meetings, although this had not been mentioned last month as a consideration. One could also sympathize with other members of the board who outlined their personal reasons as to why a time change was a challenge. I was pleased that the board, on their own, requested to create palm cards with a simple explanation of PILOTs to be made available for the public in attendance. In the end, my take-away was that the point was missed and that is, to include the public in new ways is a multi-prong process. Changing the meeting time should have been seen as a first step. Outreach and making process accessible and easy to understand (transparency), another. Ongoing storytelling and communication, another. Participation, when it doesn’t exist, takes time and effort and the board has three Ulster County employees appointed to them as staff to help. That the public does not regularly attend this or any other important public hearings, board, committee or commission meetings is a failing of at least these things. Thanks to those who took the time to participate. We’ll try again another time, in some other way.